Lincoln’s Cottage will display one of five American flags that were hanging in Ford’s Theatre the night of the assassination. The flag will be on display for one week only beginning on April 11, 2011. 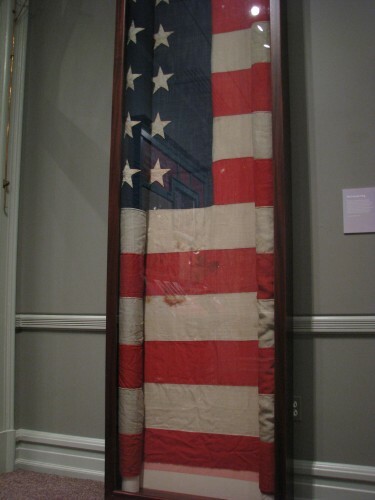 The flag is said to have been grabbed in haste from the bunting on the presidential box and used to cushion Lincoln’s head after he was shot. Thomas Gourlay, a part-time theater manager, kept the blood-stained flag that night, after Lincoln was moved to the Peterson House across the street from Ford’s Theatre. Jeannie Gourlay, actress in “Our American Cousin”, which was playing that night, and daughter of Thomas Gourlay, kept the flag in her possession until she died in 1924. It was donated to Pike County Historical Society by her son in 1954. The flag will be displayed in the Robert H. Smith Visitor Education Center, adjacent to the Cottage. In addition to this display, President Lincoln’s Cottage will host James Swanson, author of Manhunt and Bloody Crimes, on April 14, the anniversary of the assassination. The event is part of the Cottage Conversation evening lecture series. Swanson is renowned as an expert on the Lincoln assassination. Due to its immense popularity, this is currently a wait-list-only event as general admission tickets sold out in February. For more information on Cottage Conversations visit here. Opened to the public for the first time in 2008, the Cottage offers intimate, guided tours providing an in-depth, media- enhanced experience highlighting Lincoln’s ideas and actions through historical images and voices. The Robert H. Smith Visitor Education Center houses thematic galleries and changing exhibitions providing visitors of all ages opportunities for in- depth exploration of Lincoln’s life and times. For information about visiting President Lincoln’s Cottage, go to www.lincolncottage.org.